Fourth Dimension is time. Three dimensions is relate to length, width and height that any solid object has.so three dimensional space is familiar to all and it is easily visualized. But fourth dimension cannot be visualized in the same way, though there is experience of time factor. A point is of 0 (zero) dimension, a line if 1 (one) dimension and a plane or surface of 2 dimension. Since A 3D cube can be pictured on a 2D plane, 4D 'cube'' called 'hypercube' cube pictured with some effort and imagination on an analogical basis as illustrated. 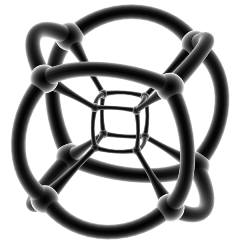 It has 6 plane faces, 12 edges, 8 vertices and 4 main diagonals. A hypercube is pictured by 2 cubes pictured apart with their corners joined. It is called as tessaract. It has 24 plane faces, 32 edges, 16 vertices and 8 main diagonals. Of course, it is a 4d picture shown on a 2D plane! As event has location and time occurrence. Measurements relating to location seem to be irreconcilable with time measures. If we recall that distances of astronomical bodies are given in light years, which referee to time, it can be extended that in 4D spaces, units of measure can be alike. Fourth dimension explains ‘Einstein’s theory of relativity’.